You must go into your phone settings, display, leds and make sure only "Downloaded apps" is enabled. Light Flow should work on the S6 and S6 edge. Light Flow Legacy is recommended for better compatibility. Previous versions of Android should just work as long as you go into your phone settings, sounds and notification and enable the LED option at the bottom of the list. If it doesn't work but you've already got this on, try switch it off and back on again and then reboot the phone and see if that helps as I've known in the past the switch to show as the incorrect state. Please note that the below document is applicable to version 3.55.2 of Light Flow and above. When Samsung pushed out 5.1.1 to their phones they made a change to how their LED control works. Previously it worked like other Android phones, but now it's non-standard there seems little logic to how it's controlled. I'd been getting reports of the LED not working and just flashing blue so decided to buy an S6 edge to specifically look into it. It took a couple of weeks of writing sample apps try and get any understanding of how the control was working, but eventually I worked out a pattern. One part of the issue is regaining control of the LED once it's turned blue and I'd had to do similar on the S3 for the USA version when initially released so I knew of a method that I thought should work. Sadly since I'd last used that, android permissions have changed around a lot and now only system apps could use this trick. I then spent a week trying several different ideas which all lead to dead-ends on gaining control. Firstly, if you've got root access on your phone, then that's the simplest. Then go into your phone settings, sounds and notifications and switch off "Led indicator". 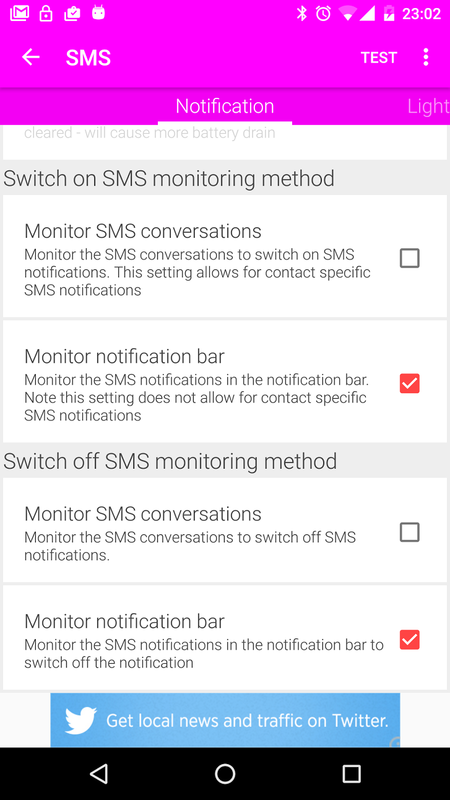 Notification Access must be enabled when prompted in the app to enable it. "Enable workaround" must also be enabled. Any apps that have the option to display a notification LED in them should be set to off. Apps such as Facebook, Twitter, Whatsapp, Snapchat and twitter all have this option. This allows Light Flow to keep control of the LED. Some apps don't have this option but there are similar apps that can be used instead which have the option. For example, Gmail doesn't have the option by "Inbox by Gmail" does. 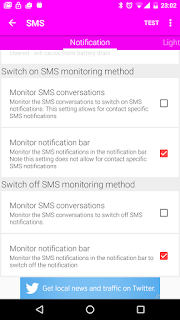 Messenger doesn't have the option but many 3rd party texting apps do. For apps where there's no alternate app with more control or where you don't want to change app Light Flow will control the LED for them, but it'll have a few side-effects on the actual notifications which are listed below. There are a few side-effects for Light Flow controlling apps where the native app is raising a notification. Getting the icons required for this for several thousand apps would be far too time consuming, but you can help. If there's an app that shows you a "star" where you'd normally see the real icon, Light Flow will have automatically created a backup of that icon and placed it into a /lightflow/app_icons directory. If you email the files in this directory to support@reactle.com then I'll add them into the next release. I plan to keep looking into different ways to get things working with fewer side-effects and also to chase Samsung regarding their inconsistent approach to LED control that they have introduced.